A woman was ‘left shaken’ after fighting off a suspected teenager who tried to steal her handbag in Banbury. The 50-year-old woman was approached by a man on Woodgreen Avenue near the junction of Penrose Drive at around 4pm on Wednesday (June 13). The man attempted to grab her handbag but was fought off by the victim and left with nothing. 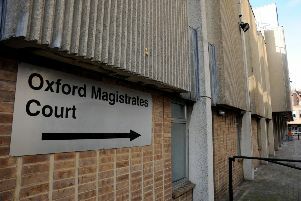 The offender is described as a mixed race, aged between 15 and 18 years-old, with black hair and a very distinctive haircut that had been shaved around the side of his head, believed to be a pattern or a scar. He was wearing a dark coloured T-shirt and black tracksuit bottoms with a white stripe down the side. Detective Constable Natasha Long said: “Although the offender did not succeed in stealing any property from the victim, this was an unprovoked incident that has left the victim shaken. “I would like to hear from anyone who may have seen the incident or who may have seen a male, matching the description, hanging around the area around the time of incident. Anyone with information is asked to call 101 quoting reference ‘43180179323’, or contact Crimestoppers anonymously.